This morning we celebrated the Kingship of Christ with a Choral Service produced by the Royal School of Church Music. We thank Hugh MacDonald who played the organ and led our choir during our rehearsals & we also thank singers from other churches who helped swell the numbers in our own small choir. 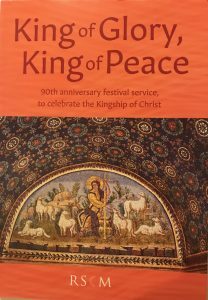 It was an uplifting, moving and joyful celebration of Christ the King.